In fall, 2015, we observed some significant changes on the free, mobile and online graphics front. Canva expanded to India, likely to be its 4th largest market. Photoshop Fix will be available for free on iPad, joining Pixlr and Aviary (purchased by Adobe last year) in the free mobile photo editing market. These programs, coupled with other services like Google Fonts, WordPress, and UI kits put creative power in the hands of anybody who has a vision for a design project. Even as marketers become increasingly visual savvy, new data suggests they’re also adding more professional designers to their teams. According to the U.S. Bureau of Labor Statistics, employment opportunities for graphic designers are expected to grow by 7 percent between 2012 and 2022. B2B use of illustrations in content marketing is up from 69 percent to 76 percent this year. Graphics are crucial for improving marketing results. Keeping up with changes in the design and tech industries is a must for anticipating how to best reach your audience with visuals. Early in the twentieth century, graphic marketers needed to design for print, which mainly only included posters, billboards, and newspapers. By mid-century, television was added to the media that designers needed to optimize for. Now, marketers are tasked with designing graphics that are suitable for TV, print, phones, tablets, and computer screens – sizes now range from 17,000 square foot LED billboards in Times Square, to 13-inch screens, to half-inch app icons, to 16-pixel favicons. Brafton’s Design Director, Ken Boostrom stays ahead of the curve by recognizing that “media defines new aesthetics and style for graphics. Graphics will need to be mobile, interactive, or different sizes and still tell their story.” Responsive design is leading designers to find a unified balance for all the graphics they make. It can be a major challenge to keep graphics as consistent and scalable as possible to fit these widely ranging formats. 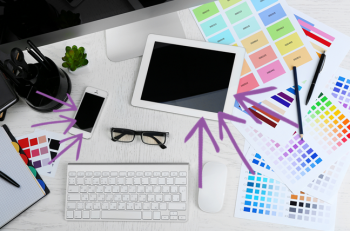 In addition to the ever-rising number of new ways to consume images, there is a surge of free, online, and mobile graphics tools available to marketers. These tools grant new designers access to modern graphics capabilities, and have contributed to the latest paradigm of design simplicity and aesthetics. You may have noticed the trend: Modern digital design is flat, but dynamic. It’s colorful but muted; minimal but bold; modern but retro. The number of venues for brands’ graphics, combined with a growing amount of enterprises and designers, is informing the style of modern design and re-imagining the tools we use to create it. This is particularly notable in small businesses. How are companies using modern designs? The simplicity and abundance of this new generation of graphics programs eases the difficulty of designing responsive, scalable graphics. Minimalism and flat sensibilities have cemented their role in graphic design for major brands because they can fit all formats, sizes, devices and media. Once informed by real-world design, digital graphics now can often inspire it. The days of skeuomorphism (the digital representation of real-world objects) are over for the most part (though aspects of it make some resurgence in material design). Instead of app icons designed to look like beveled, textured metal buttons, we’re more likely now to see billboards in the style of digital flat tiles, or business cards that look more like a website’s landing page than a piece of cardboard. This fall, both Good Morning America and KABC (LA’s local ABC news station) unveiled new branding complete with simpler color schemes, flattened text and logos, and simple geometric “cards” with text. Effective graphics aren’t just trendy and modern for the sake of keeping up with the current design fashion. Rather, good graphics are optimized for modern formats, devices and lifestyles. Here’s our list of best practices to stay ahead of the curve in 2016, and keep your graphic content appealing. Here’s a look at how our client’s website engagement was lifted 225% thanks to custom visuals.